In Champagne silver with a full black leather interior. A fine 300 SL with the 3.0 litre, six cylinder engine and a four speed automatic gearbox with Sport mode. The excellent specification includes cruise control, a Becker Grand Prix stereo, electric windows, heated front seats, headlight wash wipe, 'flat face' alloy wheels and a factory hard top. It has the rare options of a full leather interior in black with heated front seats, factory rear seats, and headlamp wash/wipe fitted. It has only 48,000 miles covered since new with service history and MOTs to support and has had six owners since new. It comes with the orginal Dealer pack and manuals. 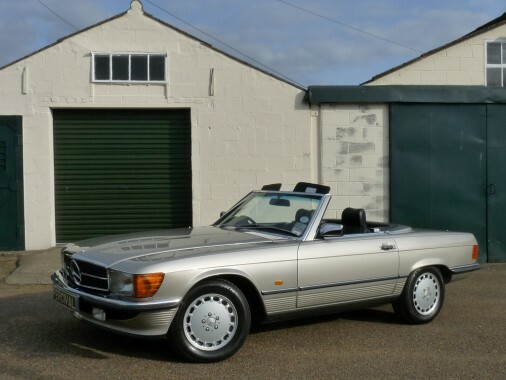 This lovely Mercedes is in excellent, unmolested condition throughout.